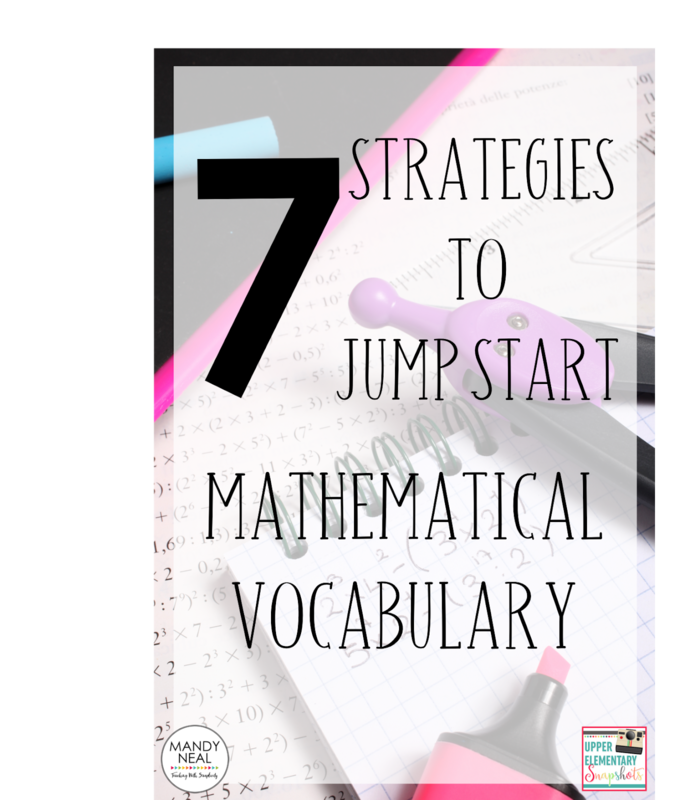 Teaching mathematical vocabulary is something that can be easily overlooked. 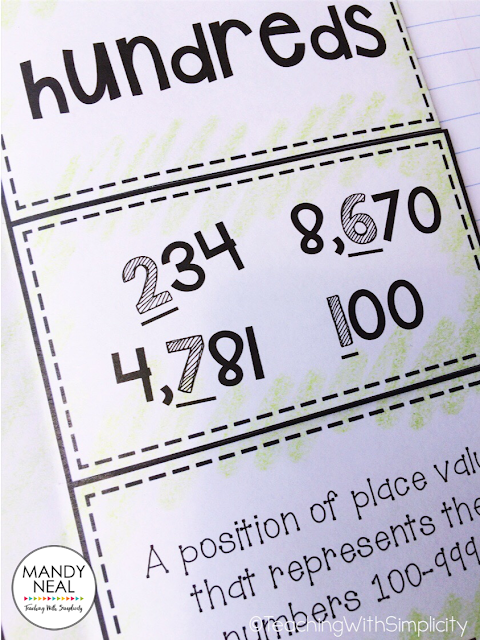 We want our students to be able to complete the math tasks at hand, but the vocabulary doesn't always seem as important. Just like with any subject, students cannot learn what is being taught without being able to understand the language of instruction. Before beginning any unit or chapter, preview what you are going to teach to determine the vocabulary that is essential to student's understanding. 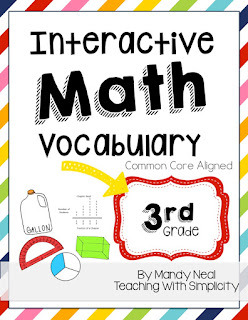 Most math curriculums already have these vocabulary words outlined for you. 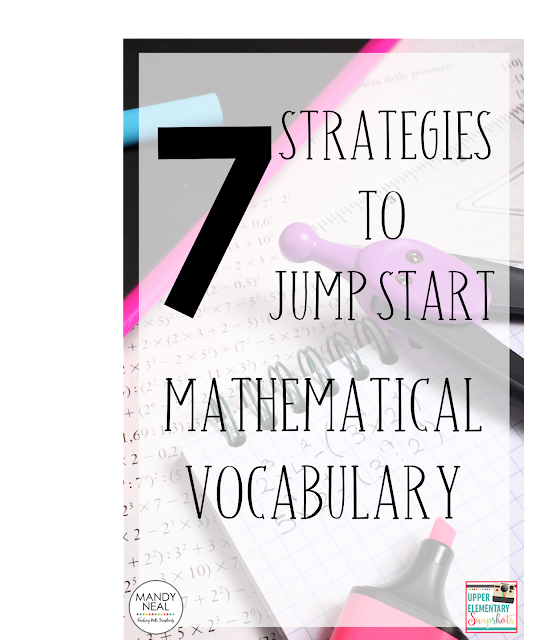 Once you have determined the words that are important for students to become familiar with, you can use the seven strategies below to introduce, model, and reinforce the mathematical vocabulary. Consider this a preview of words. Before you begin teaching the mathematical concepts, have a day where you showcase the words. Introduce the word, its meaning, and give a brief example. By introducing the words before the skill, it is allowing students to focus on the word, not the new content being taught. Model the vocabulary with appropriate problems. Make sure to use the vocabulary when teaching. For example, instead of asking for the answer, ask students to find the sum, difference, product, or quotient. After vocabulary has been introduced, have students explain the meaning of each word using their own words. Have students provide their own examples in mathematical terms. 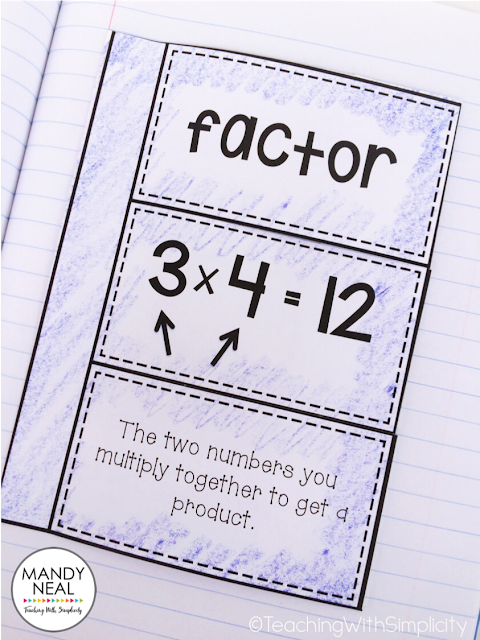 For example if they are working with the word "factors", have student write various number sentences where they label the factors in each of their sentences. Have students list ways in which the word may be used in real world scenarios. This will help them in making valuable connections. We have a word wall for high frequency words, so why not a math word wall? Create a math word wall to reference periodically throughout the day/week. Give clues for a word, then students have to figure out what word you are describing. I like to call this "Being a Mind Reader". They love it! I have a habit of using mathematical vocabulary throughout the day, and it is really effective. For example, when I line students up I might ask for students sitting around the "perimeter" of the room to line up first. I might also ask for students whose class number is "even" to line up first. Integrating these words throughout the day makes a HUGE difference! 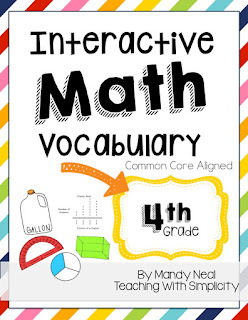 If you're looking for a resource to get you started, take a look at my Interactive Math Vocabulary resources. Click on each image to take you to your specific grade level!